The phrase "true love knows no boundaries" aptly describes 76-year-old Saadiah Abdullah. Her undying love for her late husband Alias Nik Daud, a policeman who died at the hands of communist insurgents in 1975, has seen her cycling to his former workplace daily for the last 37 years. Every morning since he died in an ambush near here, she wakes up early to prepare her husband's favourite food and delivers it to the Grik police headquarters. Saadiah cycles 5km daily to the police base despite her age, delivers the food and cycles back to her home in Kampung Padang. The food usually consists of sambal belacan, ulam and curry with white rice -- her husband's favourites. She also distributes sweets and chats with the policemen before leaving the base. The mother of three, who is still healthy and strong, has been following this routine for more than three decades. Saadiah said what she is doing has angered many of her friends and relatives but she was not going to stop. "I miss my husband very much. I think of him daily and that is why I continue to send a food package every day to the police base where he worked," she said at the police headquarters here yesterday. She said she used to deliver food to her husband every day at the station when he was alive, adding that her husband loved her simple cooking, which would also include kuih-muih (cakes). "I always get this strong feeling that my husband tastes the food that I deliver to the station every day. Saadiah's youngest son, Wan Jelani Alias, 42, who is attached to an army camp here, said his mother continued her daily cycling to the Grik police headquarters because she could not forget his father. "I have advised her many times to stop cycling to Grik because of her age and safety reasons but she refuses to listen." 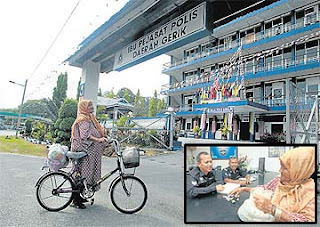 Meanwhile, Sergeant Ahmad Bakar, 51, who works at the district police headquarters here, said Saadiah's husband Alias died in an ambush when he was tasked with delivering food to policemen fighting the communists in the jungles of Grik in 1975. "We don't know what goes on in her mind but from the little conversation we have with her, it seems she still believes he is working at the base." Ahmad said Saadiah would deliver freshly cooked food around 10.30am every day and would distribute sweets to everyone on duty before returning home, adding that the officers on duty would take turns to eat the food she leaves at the station. "We are used to seeing her every day. Never a day goes by when she does not come here.